Every single personal success you have had in your life happened because you took a chance. You may have calculated the risks and felt the odds were in your favour or you may have thrown caution to the wind and made a leap of faith. Either way, by taking that chance, your life moved forward. In reality, life is one big chance. Every choice we make everyday has potential to totally change our lives. Even getting out of bed can be a chancy proposition. Will my morning routine run smoothly? Is the weather outside going to add an element of danger to my commute to work? Will my job even be there when I do safely arrive? Evolution, knowledge and modern technology have created a relatively safe environment for humans to live and prosper so that now day to day survival is no longer our primary focus of life. Now we are able to make choices that fulfill our life’s passions and for some folks those goals are even scarier than the Neanderthal’s chance of running across a pack of wild animals. 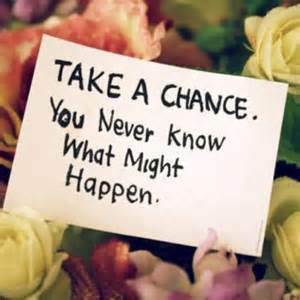 Yet in order to live up to your full potential, you must take chances. Pursuing a dream, declaring your undying love for another, even mastering an art requires a faith in yourself that you deserve the chance to follow your hearts desire’s. When you believe that simple truth, that everyone deserves happiness, your life will shift. The operative word here is everyone. There is two ways to think about it. First by being afraid to take a chance on something, you rob yourself of the possibility of an amazing experience but you also rob others of that same possibility. If your dreams come true, many people benefit. An artist’s success means others are made happy by his work. Finding your one true love means that your mate found their one true love also. The second way to think about it is when you take a chance you open yourself up to chance, a unexpected, serendipitous event not planned by anyone. That is when magical things happen. Sometimes, all the universe is waiting for is for you to take that leap of faith and it will reward you with putting someone or something right in your path that speeds you light years ahead with your goal. Like in games of chance sometimes you can win really big. Taking a chance can also be a very enriching experience by bringing wonderful people into your life. Stepping out of your comfort zone and returning a smile or striking up a conversation with someone you would never consider talking to, may just expose yourself to amazing wisdom, and a broader perspective of the world around you. Life may be short but while we are here why not sample as much of it as possible. You don’t have to take huge risks with your life like jumping out of a plane or swimming with sharks but if there is something that sparks your passions why not open yourself up to the possibilities of the adventure and take the chance that might just create a fuller richer experience while you are here. Thank you for this message! That is exactly what I am trying to do in my life: taking a leap of faith. And it is very good and refreshing to hear that without taking some chances, risks, and choices in life, we will not be happy and so will not other! Thanks for the comment Veronika. I wrote “Take a Chance” as a reminder for me to not over think things and just leap. Glad to hear you got the message too. Join the Crony Crew and click here to follow this blog! Crone Confidence · Wise, older woman – the most powerful brand females come in.